Judith Lang Zaimont begins the summer music season with a world premiere, and three (!) distinctions for her music. On July 19, the Camerata Bern offers the first performance of Zaimont’s new JoyDance in Spring. Commissioned by the ensemble for its “Encores” project to celebrate its 50th anniversary, the new work is scored for a string orchestra of 14 players. 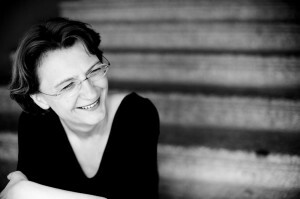 Antje Weithaas conducts the concert which is part of the City ofGeneva’s annual summer festival. Speaking of Spring, Zaimont’s music was recently recognized with three distinctions. 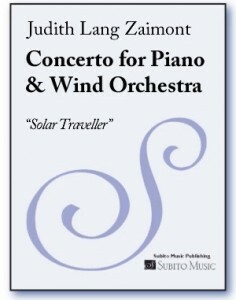 Her “Solar Traveller”, Concerto for Piano and Wind Orchestra was one of three pieces to be honored with a 2012 American Prize in Composition. Commissioned by a consortium of university wind ensembles, “Solar Traveler” was the only work composed for non-traditional orchestra to receive this year’s award. Zaimont’s Serenade, in its piano trio version, won first prize of the Third Millennium Ensemble’s 2012 Competition. The DC-based new-music group will perform the work during their upcoming fall season. Lastly, the composer’s Wizards: Three Magic Masters (for solo piano) was required repertoire for the 2012 Kapell International Piano Festival, held at the University of Maryland’s Clarise Smith Performing Arts center. Wizards was also recently released on Albany Records (TROY 785), performed by pianist Young-Ah Tak.